A brown and light beige python-print swimsuit by Lanvin . Twisted shoulder straps. The sides are elasticated and ruched. Draped back. Gathered front. Fold-over square neckline. Fitted. Lined. 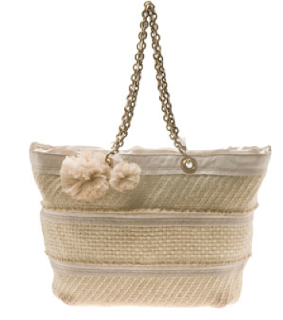 Beach bag featuring a tiered series of woven jute by Lanvin. The three rows of different jute weave are interspersed with blush grosgrain ribbon. A large and small tulle rosette adorns the bag. Large leather lined eyelets allow a lacquered brass chain to attach to the bag. Blush tulle is entwined between the chain links. Interior zip pocket. Full twill fabric lining. Lanvin label inside. Black crepe sandals with a floral decoration made of silk petals, crystal stones and sequins by Lanvin. Open almond-shaped toe. Cut-out detail in the sides. 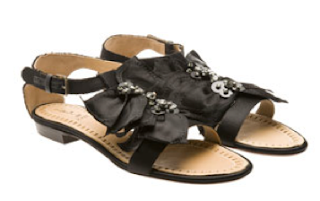 Ankle strap closure with brass buckle. Leather cushioned insole.